Some years ago, our firm conducted a lead management audit for a technology client who was struggling to convert raw, inbound inquiries into sales qualified leads. During the audit, it became quickly apparent that one of the major issues was at the very front end of the lead qualification process. At this particular company, all leads flowed first to a team of Sales Development Reps (SDRs), and were required to be contacted and qualified by that team before proceeding further along the funnel. As a result, and due to the low rate at which the SDRs were able to engage with those leads, more than 80 percent of inquiries stalled at the very first step of the lead management process. This anecdote – and others like it – underlines the fact that SDR engagement is a critical factor in the ability of companies to qualify leads and maximize their return from inbound lead generation. It’s also why the data contained in a new report from Insidesales.com is so compelling. 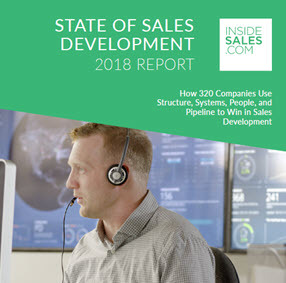 In their “State of Sales Development: 2018 Report, ” the authors deliver 43 pages of benchmarks and trends that illustrate how today’s leading companies are succeeding in sales development. In the context of the report, the first point argues for SDRs to employ other channels beyond just phone and email. The second makes the case for fast response times. But I would argue that both points are also a business case for the integration of automated lead nurturing and sales enablement campaigns into the SDR process. I’ve written previously in this space about how automated lead nurturing works best, not as a dumping ground for unqualified leads, but as something that works in parallel with sales development to increase lead conversions and maximize SDR productivity. Indeed, in the client example I related earlier, when we implemented a series of automated emails as a complement to SDR outreach, lead conversions jumped more than 33 percent. Yes, you can tightly manage lead distribution and SLAs to ensure that leads get called within 5 minutes. But how much better if that first outreach is automated? It ensures that every lead gets a prompt, personalized response, regardless of sales bandwidth, and the resulting engagement with that first touch (or lack of engagement) gives the SDR more information with which to prioritize human follow-up. Now that more and more SDR teams live within the marketing organization, there’s even less excuse for those inside sales teams to function without closely coordinated marketing support. By bringing the right technology, strategy, and creative to bear, the marketing team gets better bang for their demand generation buck through higher lead conversions, and SDRs are more productive – and successful – thanks to leads that are “warmed up” and more inclined to engage with sales. This entry was posted in Demand Generation, Inbound marketing, inside sales, Lead Management, Lead Nurturing, Marketing Automation, Sales Enablement, telesales and tagged inside sales, inside sales best practices, sales enablement, sales enablement best practices, sales enablement tips, sdr engagement, sdr engagement rates, telesales, telesales best practices on January 17, 2019 by Howard Sewell.